Do you want only the best in garage door repair? Your garage door is an important part of your home. If you’re tidy enough to keep it clean, it’s a space to store vehicles and something you use every day. And even if it’s full of odds and ends, you still need to use it frequently! So if the door stops working as it should, it can be more than a headache. Your car could even be trapped inside giving you no way to work! 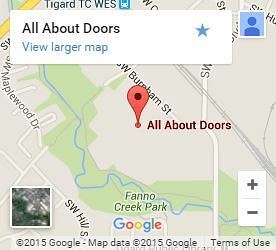 Before you panic, call All About Doors for garage door repair in West Linn. We’ll hurry on out and fix your garage so nothing’s stuck inside or out! Open garage doors are troublesome too! While you might breathe a sigh of relief that you can still get in and out with an open door, criminals can too! We recommend getting this issue taken care of as quickly as you can by one of our professionals. Our team does their best to get to you as soon as possible. Often, we’re even able to do same day service! We know that waiting around is stressful, so do what we can to make sure you aren’t dealing with your problem for long. Don’t try to fix it yourself! While a spring repair might seem like a simple job, keep in mind that these springs are powerful enough to move the heavy door and withstand immense amounts of pressure. Many people have been critically injured attempting this repair without proper training. With fast and friendly service and a 30-day minimum guarantee, you won’t find a better value anywhere around!